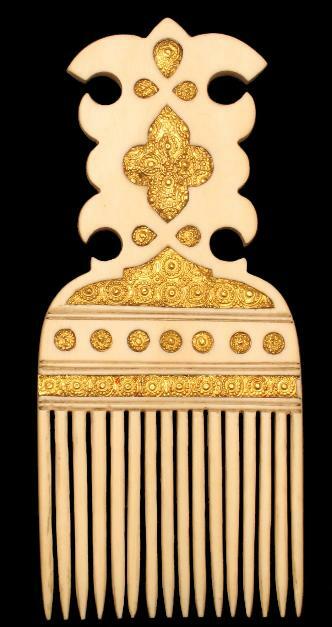 This fine and extremely rare ivory comb is a beautiful example of Zanzibar craftsmanship. Cut from a single piece of ivory, it has sixteen prongs and is inlaid on both sides with chased gold plaques. There are no losses either to the gold or the ivory. It is of an unusual form and has in the past been attributed to Sri Lanka, but the gold panels and the form of the ivory can now be seen to related to the ivory and gold work used on Omani-influenced sword hilts that were manufactured in Zanzibar in the eighteenth century. Most likely used to comb long, wet hair to help with the drying process, the comb undoubtedly was an item of considerable prestige and probably was given as a wedding gift. Zanzibar comprises two larger islands and a series of smaller islands 25-50 kilometres off the coast of East Africa. Arab traders visited and traded with the islands for many centuries. In the 16th and 17th centuries, Zanzibar was under Portuguese control. And in 1698, it was sized by the Sultanate of Oman, and a ruling Arab elite with a local sultan was installed which developed the local economy further enhancing its trading links with the Middle East and with India. Important trading communities of Muscat-descended Arabs and Indian Muslims established themselves in Zanzibar. The Indian Muslims comprised Ismailis – Khojas – and Bohoras particularly. Parsees from India also were another significant community. Another Muslim community, the Wahadimu, evolved too, by intermarriage between Africans and Arabs. Other groups included Ceylonese, Christian Goanese of Portuguese and Indian descent, and Indian Baluchis. Zanzibar became renown as a source of ivory, spices and slaves. It also became a regional entrepot and was an important source of goods that were traded into Africa. The Sultan of Zanzibar also controlled parts of the East African coast which also facilitated this. By the mid-19th century, Zanzibar was the biggest slave centre in East Africa with around 50,000 slaves passing through its docks each year. By the late 19th century, Zanzibar was under the control of the British. The islands gained independence from Britain in December 1963. A month later, the Republic of Zanzibar and Pemba was formed in a revolution that saw thousands of Arabs and Indians killed. The following April, the republic was subsumed into the mainland former colony of Tanganyika (later Tanzania). Zanzibar today has semi-autonomous status.